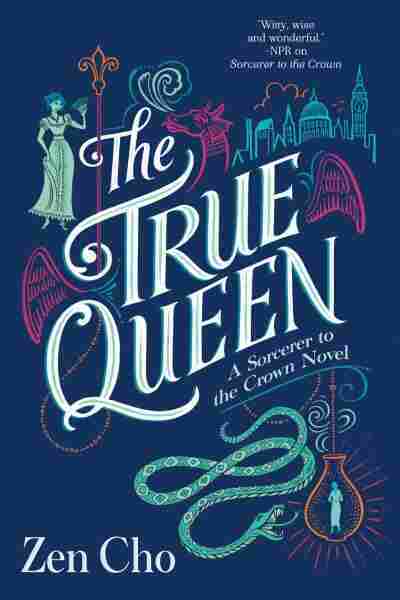 Book Review: 'The True Queen,' By Zen Cho Zen Cho's followup to her Regency fantasy of manners Sorceror to the Crown builds solidly on the world she's invented, mixing historical froth with real substance. Poor Muna's arrival in England is less than auspicious. She and her sister Sakti are refugees from Janda Baik, sent away by their mentor Mak Genggang to seek the mystery of their past (and avoid an international incident with colonizers). But Sakti vanished during the sisters' journey through Fairy. And Muna's quest to get her sister back is complicated by British thaumaturgical politics, the mysteries of Fairy, and the fact that Muna has no magic — and nothing to wear to Amelia Stapleton's coming out. His adventures alongside Prunella Gentleman, boarding-school runaway and magical savant, shook English magical patriarchy to the core, but that first book was as interested in drawing-room politics as the supernatural world, and though it brought a gently satirical eye to its alternate history, the balance tipped in favor of whimsy, even occasionally when the setup suggested something more dire. Still, it was a world that left plenty to explore, and had real energy to its magic — particularly in the periphery of the plot's major mysteries. There, it occupied a clever nexus of gender, class, and race that left plenty of room for exploration. And here, we have it. The True Queen makes smart use of the world that Sorcerer introduced; it isn't necessary to read Sorcerer to follow the state of English magic, and The True Queen's shift in perspective offers more than just Easter eggs to the returning reader. Prunella's confident carelessness, which the first book tended to blithely skim over, takes on a sharper edge through Muna's eyes. (She finds a better ally in Henrietta Stapleton, a proper young Englishwoman whose magical abilities are the family secret.) And England's violent resistance to the idea of magical gentlewomen is more horrifying to an outsider than to the young ladies of Britain for whom the occasional bomb seems merely a nuisance. 'The True Queen' makes smart use of the world that 'Sorcerer' introduced. The plot quickly entangles Muna and her diplomatic skills into snarls both mortal and magical, and moves briskly through even more twists than its predecessor. (Several of them rely on very convenient circumstances that will either be frustrating or all part of the charm of a fantasy of manners.) Here, as in Sorcerer, Cho occasionally pulls back from the full impact of the magical stakes, which can rob some of the grander moments of gravitas. However, the novel's heart is less concerned with bloodthirsty fairy contracts than it is in young ladies creating magical simulacrums just to get out of paying polite visits, and what that means for the family reputation. Indeed, this novel's even more interested in family than Sorcerer, as nearly everyone — Muna and Sakti, Henrietta and her sisters, Mak Genggang and any woman she can get hold of, the girls at the school, even the occasional dragon squabble — builds family for themselves anywhere they can find it. (Not always loving, of course; it will come as no surprise in a book titled The True Queen that the current Fairy monarch has played a little dirty pool). While it can feel as if the full promise of family complications is swallowed by more pressing plot concerns, there are still plenty of enjoyable set pieces, and reading the clever deployment of weaponized manners never gets old; in Cho's charming prose, The True Queen weaves a very pleasant spell indeed.